Earlier this month, we had shared the details about the tentative specifications of Motorola smartphones to be launched at MWC 2018. The list included iPhone X-inspired Moto X5, alongside affordable offerings such as Moto G6, and G6 Plus, and top-of-the-line Moto Z3 and Z3 Plus. Now, a trusted tipster Steve Hemmerstoffer (popularly known by his Twitter handle @OnLeaks) has bared the cheapest of the bunch – G6 Play – in all of its glory. Moto G6 Play is likely to feature thinner bezels than the G5 series, although there is no clarity over the aspect ratio of the display. While other devices in the upcoming G6 series carry dual cameras, the G6 Play is likely to come with a single camera setup on the back and this is pretty much justified, given the price. Further, the G6 Play appears to be carrying a dual camera setup for selfies which is complemented by a front-facing flash. The is a ring-like structure around the rear camera which is reminiscent of the ring flash on the outdated “Moto X Pro”. But the presence of an LED flash seizes clarity from the matter. Another big difference from the other two G6 devices is the absence of a home button, as the area is occupied by a Motorola logo. It can, thus, be expected that Motorola could conceal the fingerprint sensor underneath the “M” branding on the back – it would be a shame if the fingerprint scanner is skipped. Further, the material of build is not entirely clear but CompareRaja, which leaked the renders along with @OnLeaks, suggests that an aluminum side frame is sandwiched between glass panels on both the front and the back. 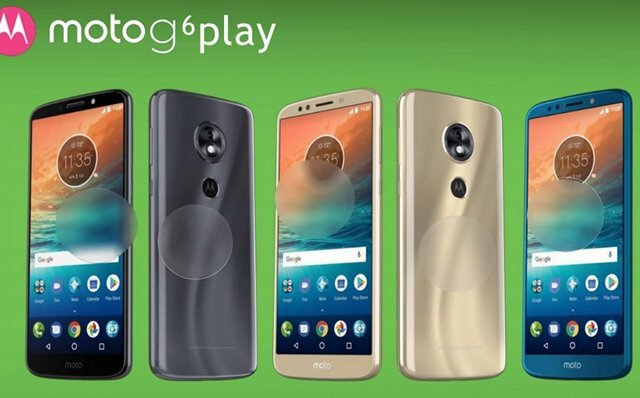 Moto G6 Play, despite its low pricing, is not likely to cut corners in vanity and will come in three appealing colors including Charcoal, Gold, and Blue. While the Moto G6 and G6 Plus are likely to cost $240 and $330 respectively, the pricing of the Moto G6 Play has not been announced. Anyway, we’ll get to know it soon as MWC 2018 is not too far away.